Spiritual and existential distress is a common form of suffering for patients and families experiencing serious or life-limiting disease, and easing that suffering is a core tenant of palliative care. The work of chaplains or spiritual care advisors is vital, not only to patients and families, but to the entire palliative care team. Core Concepts in Palliative Care—Chaplains provides chaplains with a comprehensive framework for palliative care best practices, as well as new skills, concepts and strategies to more effectively support and uplift others on the challenging journey through life-limiting disease. Originally created in partnership with one of the largest healthcare organizations in the United States, this online course has been expanded and enhanced with additional content applicable across any health system. It’s perfect for individuals or teams interested in improving care for their most vulnerable patients and families. This curriculum delivers new tools and resources including spiritual care assessments, interventions and ways to use prayer and meditation to alleviate suffering, while also exploring concepts like consent, meaning-making, dying, grief and self-care. 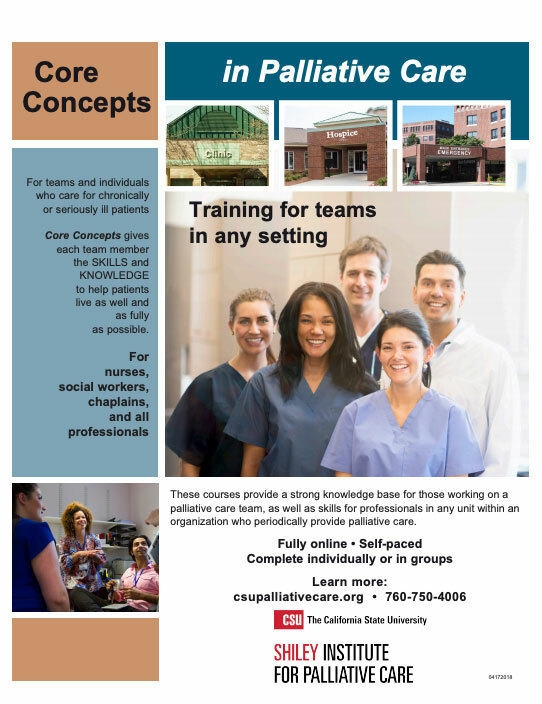 Core Concepts in Palliative Care—Chaplains offers 10 Continuing Education Hours that will enhance your practice and boost your effectiveness in supporting seriously ill patients. Studies show palliative care can improve patient outcomes, reduce hospital readmissions, lead to more effective decision-making, and boost employee satisfaction and retention. Click HERE to get the brochure. Presented in an engaging and interactive online format, this education includes Core Concepts in Palliative Care—All Health Professionals, a foundational course in the Core Concepts series. Computing skills sufficient to complete graduate coursework. Desktop or laptop computer required. Mobile devices may not work properly. Students not able to fulfill these requirements, will not be able to succeed in an online format.